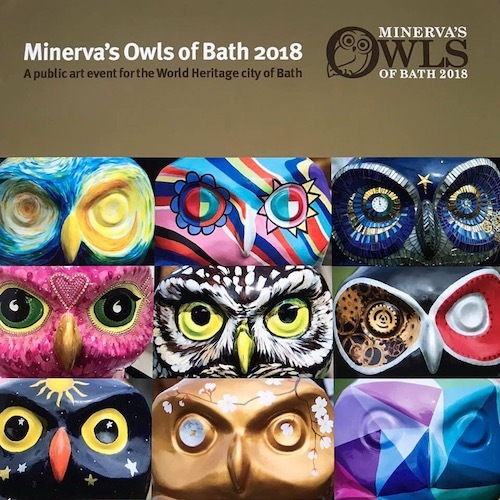 Minerva’s Owls of Bath 2018 was a major public art sculpture trail featuring over 80 individually decorated, super-sized owl sculptures displayed across the World Heritage city of Bath and surrounding region from June - September 2018. All 82 owls, plus two new owlets were gathered together for the first and last time at the Owls Hoot Farewell weekend on the Bath Recreation Ground for a weekend of feathery fun 29-30 September. 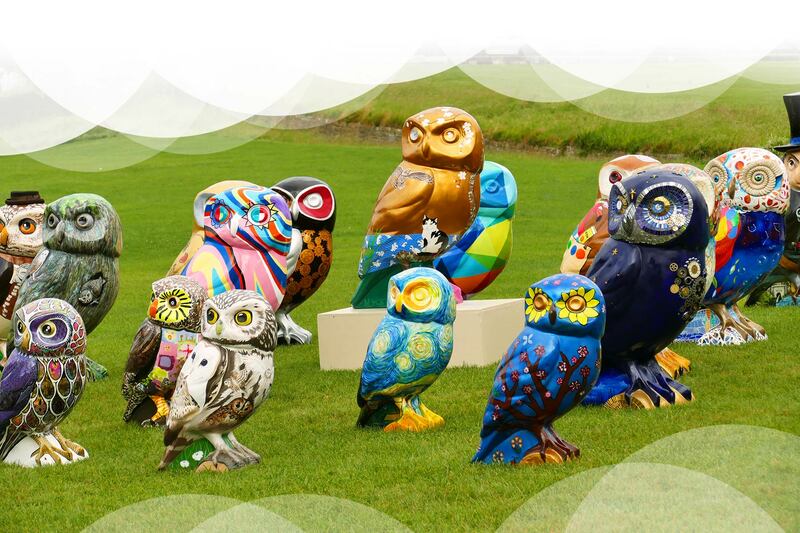 Thousands of owls fans visited to say their final farewells before the colourful sculptures flew off to the charity auction on 17th October. 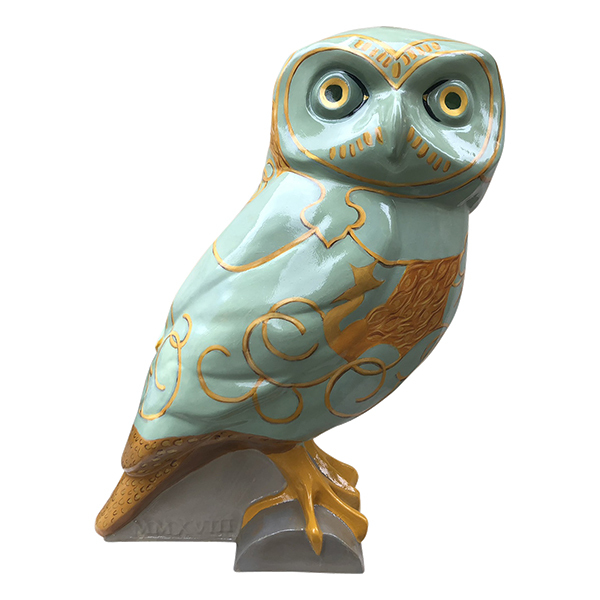 The auction raised £140,000 and the owls have now flown off to their new homes across the UK, as well as to nests in Hungary, France and Canada! 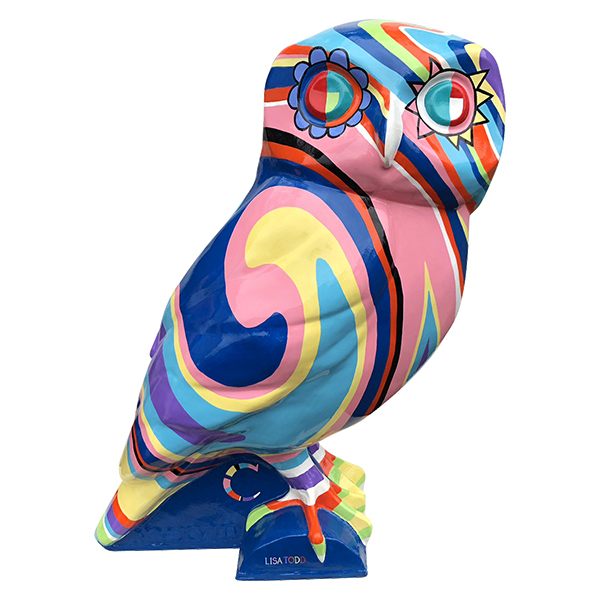 The fabulous Owls of Bath sculptures raised nearly £140,000 at October's charity auction at the Apex Hotel in Bath. 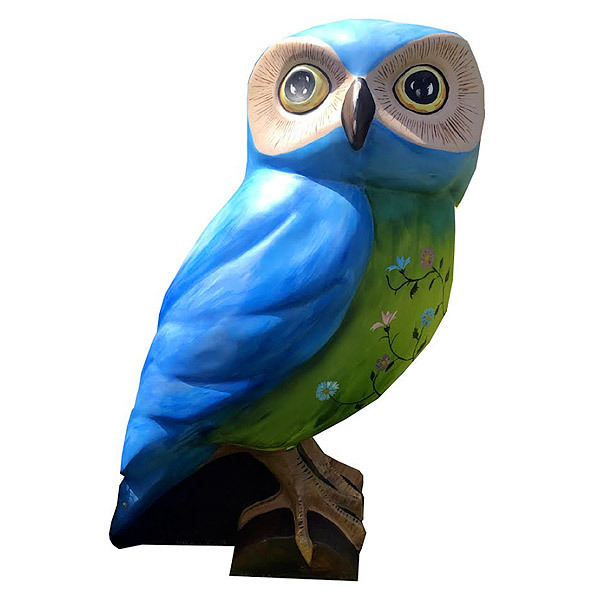 200 owl fans and bidders filled the room and the evening was hosted by the Chair of Creative Bath, Greg Ingham, and expert charity auctioneer Addison Gelpey undertook the marathon task of sending the flock on its way. 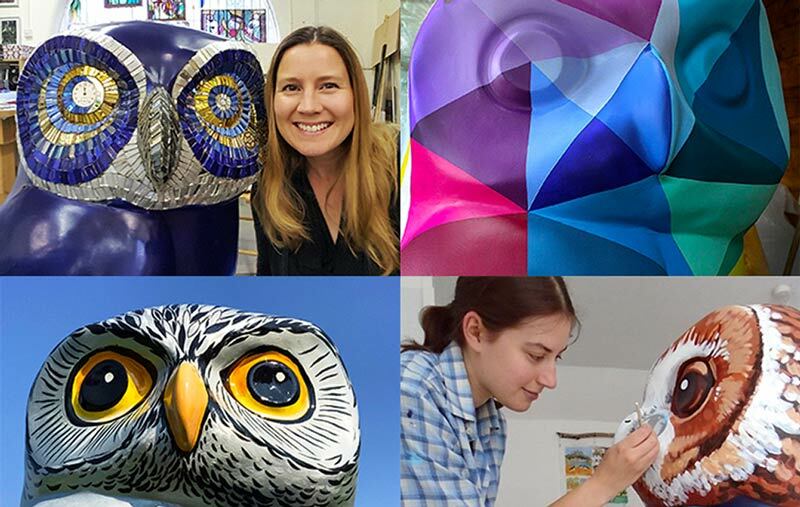 The eye-catching sculptures have now landed in new nests across the UK and beyond, including France, Budapest in Hungary and the Olympic Mountains in Canada! Owls that fetched the highest prices included Octavius, who raised £7,500, Spokes by Perry Harris and J K Owling by Jo McCarron. Horrible Histories book illustrator Martin Brown, who decorated 'Festivowl', drew the raffle to win the large blank owl sculpture, which was won by Bryan Clover from Bath, who runs the charity Evie’s Gift. 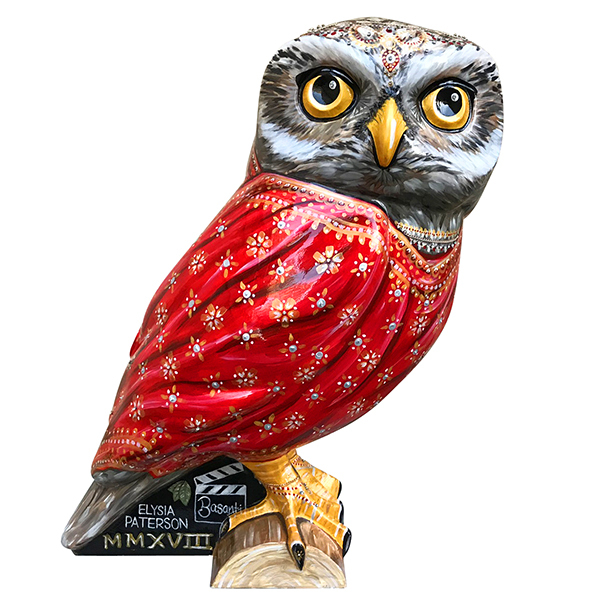 Congratulations to all of our talented Owls of Bath artists and event sponsors and a huge feathered thank you to all of the generous auction bidders! The 'Owls Hoot Farewell' auction preview weekend saw all 82 owls and owlets displayed in one giant 'parliament' on the Bath Recreation Ground at the end of September. 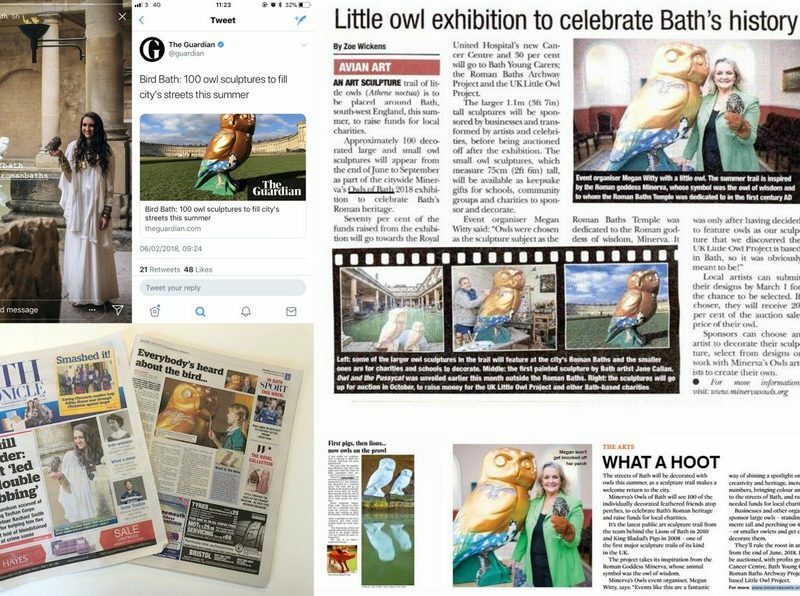 Visitors met real owls, made owl biscuits, dissected barn owl pellets with the UK Little Owl Project, made mosaic mini-owls with the Roman Baths, tried for a 'H'Owl in One' with Cumberwell Park and tested their footie skills against Bath City FC's 'Beat the G'owlie'. The event attracted over 7,000 owl fans - a real hoot of a weekend! See the gallery page for more photos. 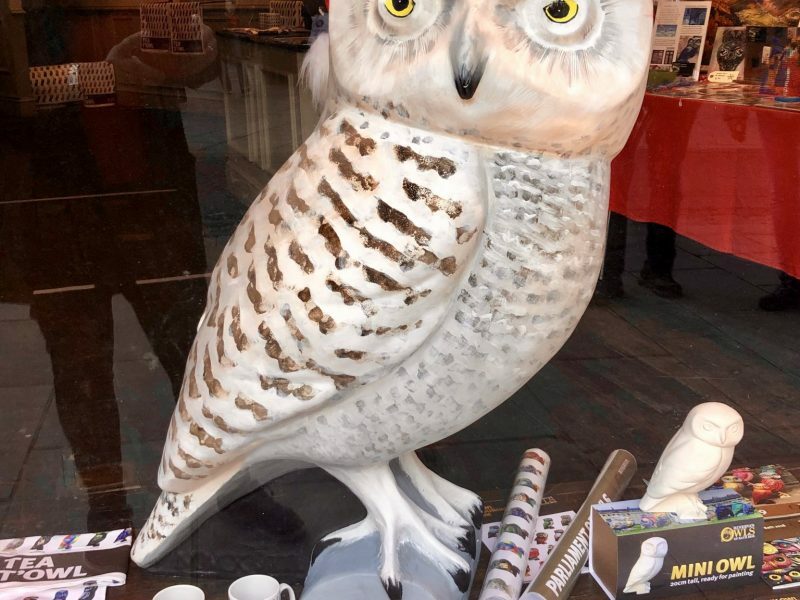 ITV reporter Eli-Louise Wringe takes to the streets of Bath to discover the first Owls on display, and find out what visitors to Bath think of the city’s new feathered friends. 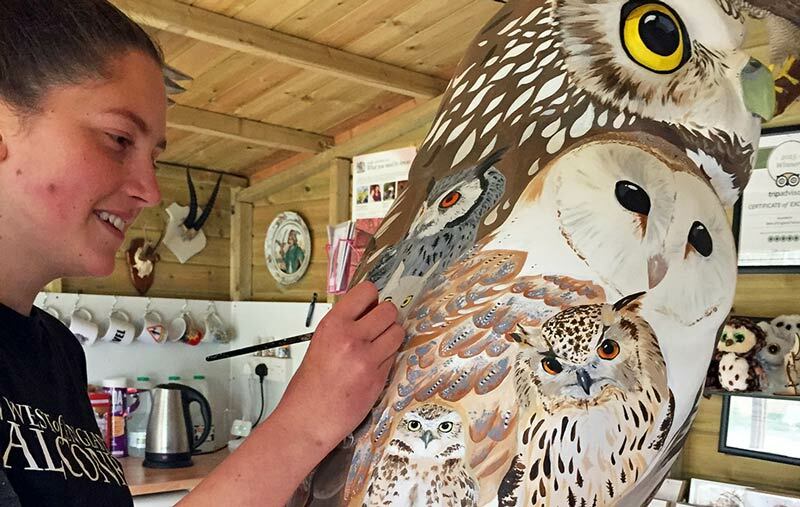 Award-winning BBC wildlife TV presenter Chris Packham, an official Ambassador for the Minerva’s Owls of Bath sculpture trail will be combining his two loves – wildlife and painting! Chris said: “I’m very flattered to be asked to owl-it for Bath this summer. 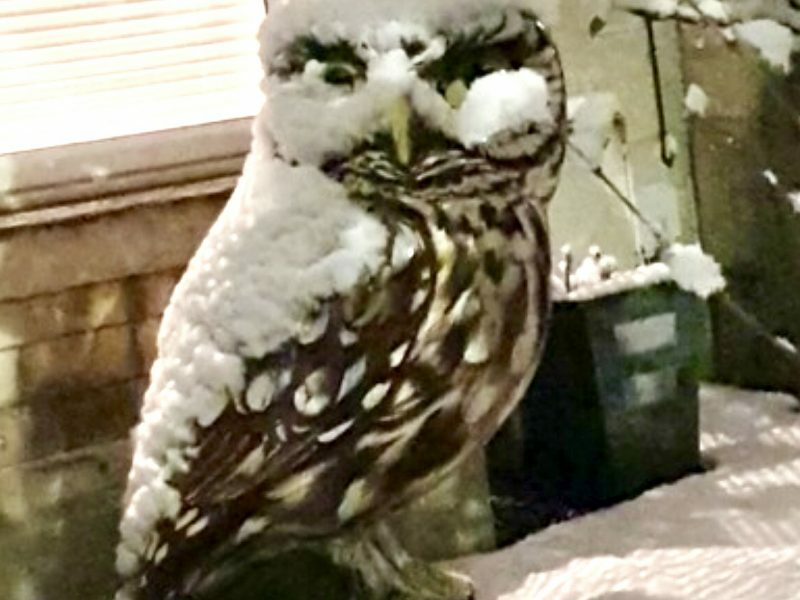 I’m thinking of anthropomorphising my owl. Maybe giving it a bit of my own history...” What a hoot! 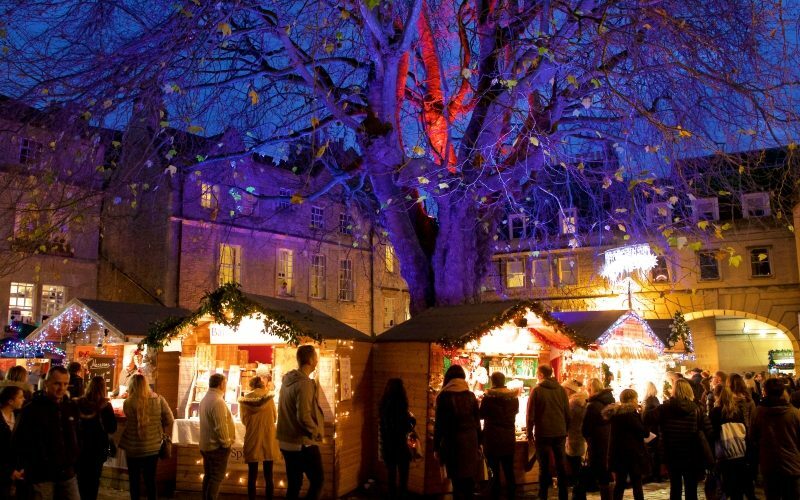 Thousands flocked to Bath this summer! 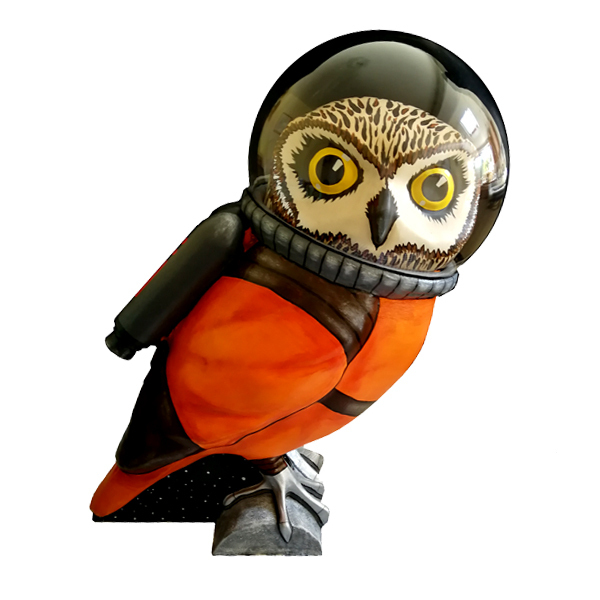 The Minerva’s Owls 2018 sculpture trail has been a fantastic way for residents and visitors to explore Bath and find out more about its businesses, artists and local attractions. The free, inclusive public art sculpture trail attracted thousands of visitors to Bath, bringing colour and fun to the city's streets . 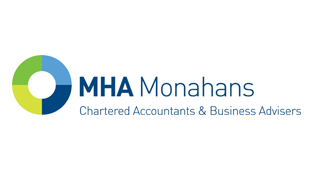 The charity auction on 17th October helped raise much needed funds for local charities. 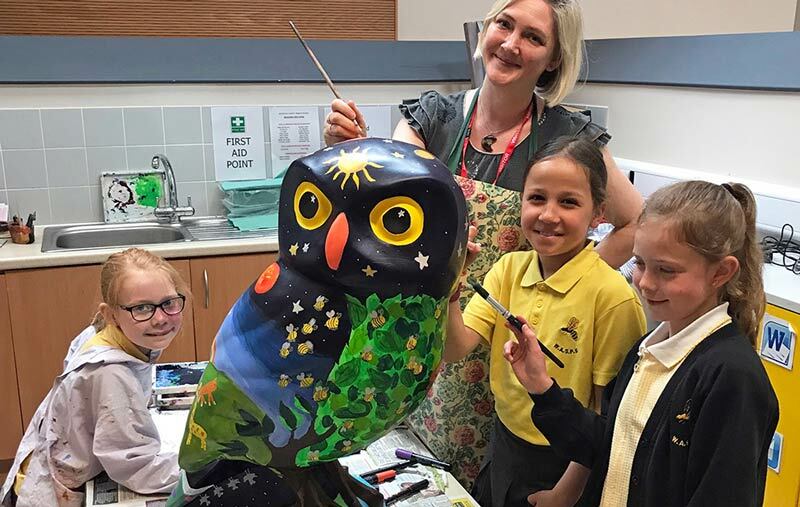 The beautifully decorated, super-sized owls and smaller owlets, decorated by schools took up their perches across the World Heritage city and surrounding area at the end of June, where they nested for nearly three months, entertaining thousands on their daily business around Bath. 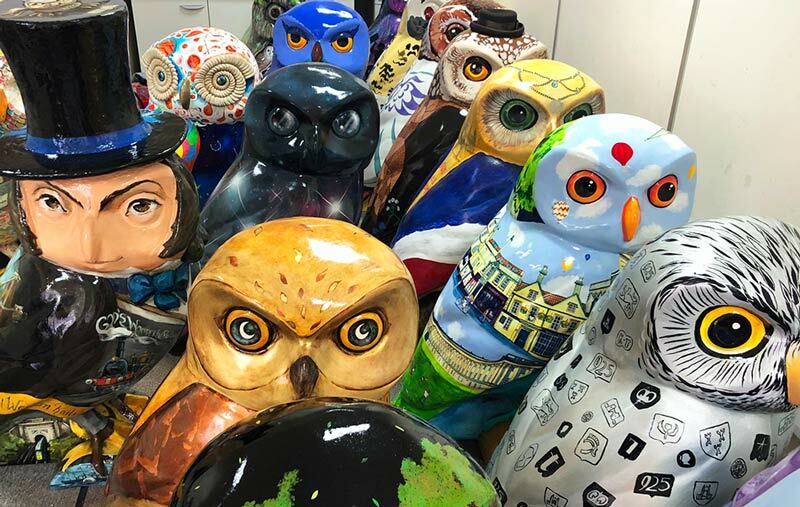 All 80+ owls were gathered together for the 'Hoot Farewell' auction preview festival on 29/30 September before the charity auction at the Apex Hotel in Bath. 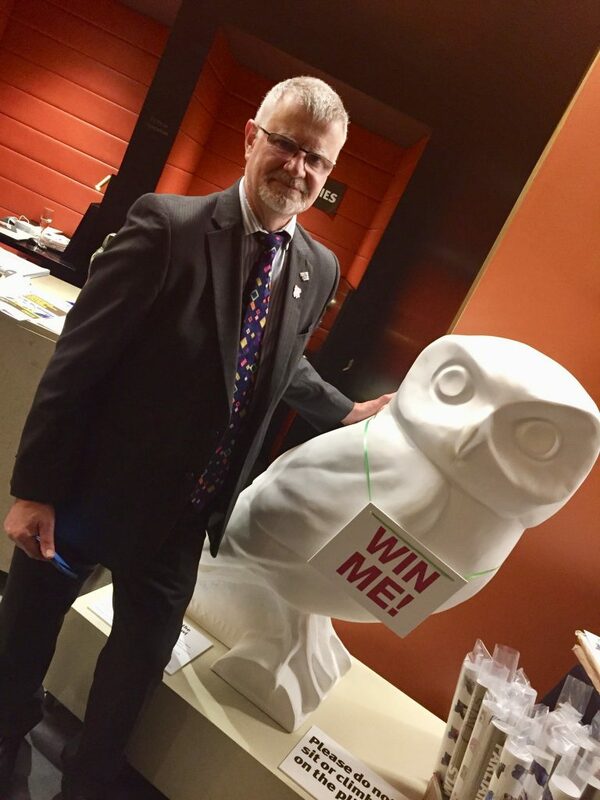 The large blank owl was won by Bryan Clover from Bath, who runs the charity Evie's Gift and will help fundraise for the charity. 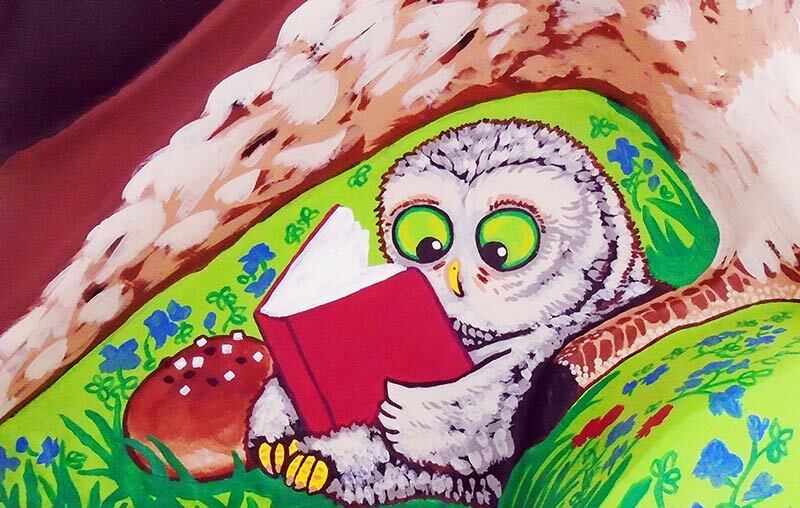 We're delighted Raff'Owl has found such a good home. The £100 of SouthGate vouchers were won by Vanessa Lopez and the full set of Horrible Histories books, signed by writer Terry Deary and illustrator Martin Brown, was won by Sally Henley from Bath. 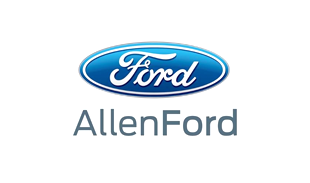 Other winners have been informed of their prizes. Thanks to everyone who entered. The owls were decorated by talented artists, designers, schools and celebrities from across the region and beyond in a wide range of styles from street art to mosaic and interactive owls that light up at night and were sold live at the Owls of Bath Auction at the Apex hotel and also online via The Auction Room. 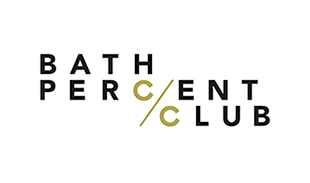 100% of event profits will be donated to the new RUH Cancer Centre, Bath Young Carers, the Roman Baths Archway Project, and the UK Little Owl Project. After the Owls Hoot Farewell weekend, the smaller owlets were returned to their schools and charities to keep as a lasting legacy of the project. 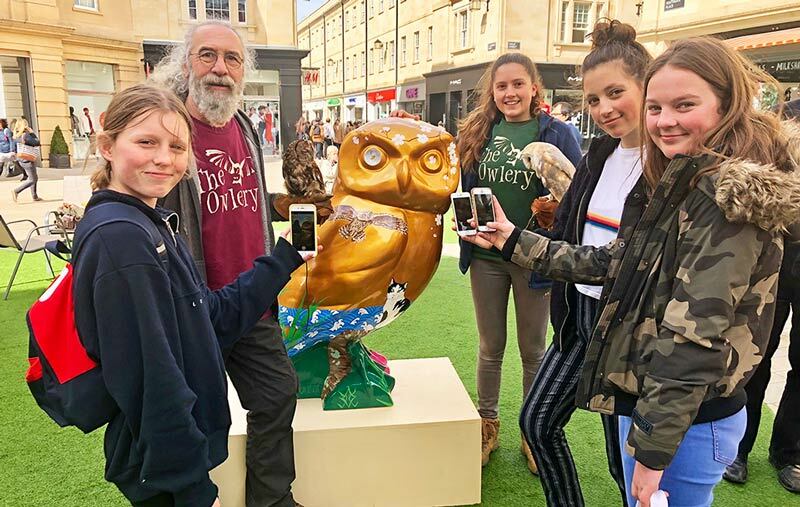 The free Minerva's Owls of Bath App was downloaded via QR codes on the owls’ plinths and owl fans were invited to 'wake up' all the sleeping owls around the city.  On approaching an owl, information about it popped up on people's phones, with a fun question to answer before moving on to the next owl. Those that visited all 82 owls and answered all their questions correctly will go into a draw to win a super-luxury pampering and activity break in the World Heritage city! The Big Hoot Prize, which was won by the Siveter family from East Sussex, included 2-nights in the boutique Abbey Hotel in the heart of the city; exclusive hire of the fabulous steaming Hot Bath with Prosecco package; cocktails and meals at some of Bath's top bars and restaurants; a Taste of Bath hamper and a night's dinner B&B at the 16th century Swan Hotel in nearby historic Bradford on Avon, with a round of golf for four at the award-winning Cumberwell Park - home to real Little Owls! 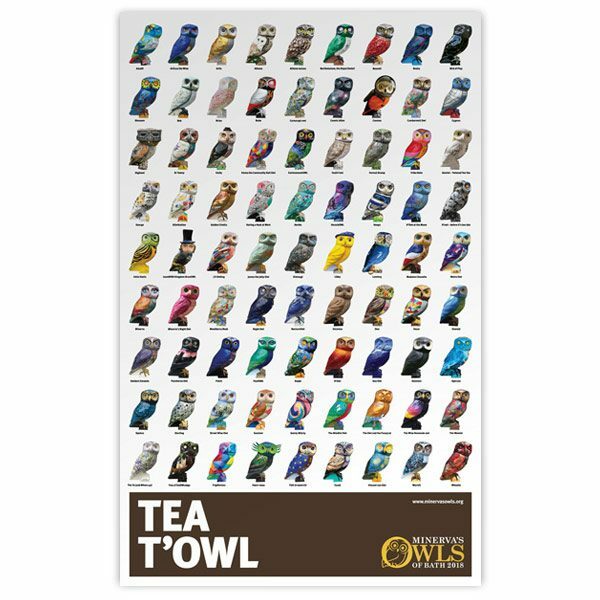 Pop up Owls shop – Thursday! 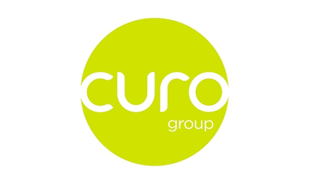 Offering businesses new opportunities to engage with staff, customers and the media. Encouraging repeat visits from regional residents and visiting friends and families. 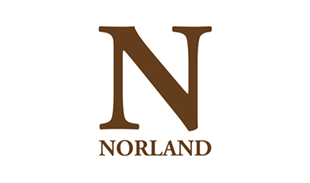 A free, inclusive activity for residents and visitors of all ages. Generating a feeling of fun, happiness and pride in the city. Raising much needed funds for local charities. 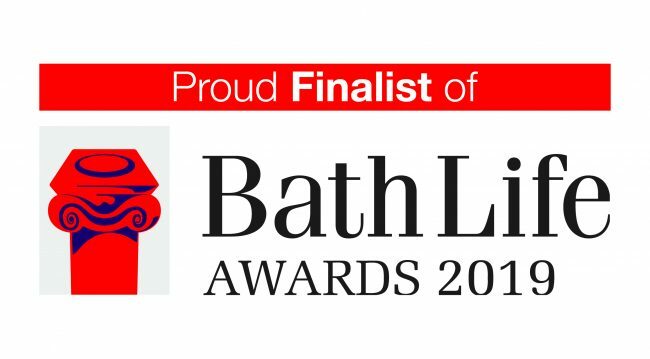 Generating extensive media coverage and social media content, helping to promote Bath and the surrounding region across the UK and overseas. Creating an additional early evening activity, bridging the period between Bath’s day and night-time economy. 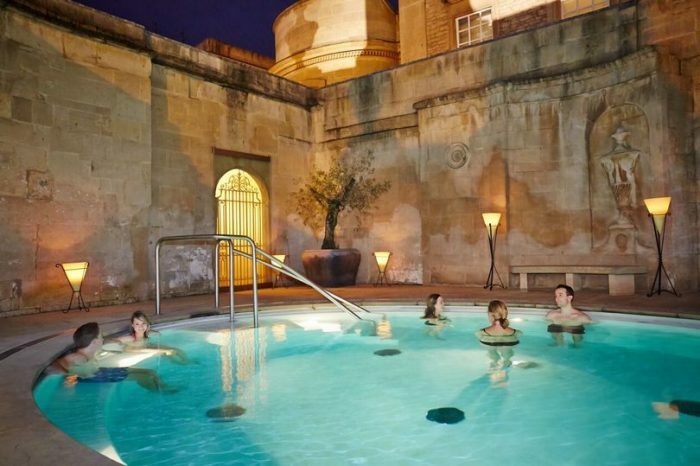 Encouraging residents to rediscover Bath and to become tourists in their own back yard. Little Owls have decreased by 70% over the last 20 years. 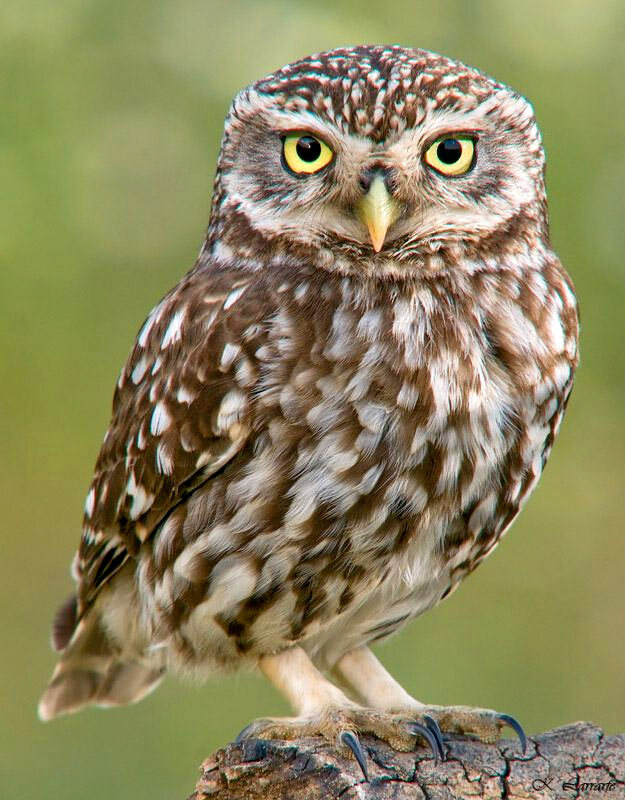 The UK Little Owl Project is working to protect them and is based in Bath.